WASHINGTON — A peace deal, brokered to keep the peace on the Easter holiday, fell apart in Ukraine as pro-Russian gunmen refused to back down from their barricades outside Ukrainian government buildings in the east. Reuters reported that the West, U.S. and European Union officials, condemned the stubbornness of the gunmen and said they will impose more economic sanctions and hold Russia accountable. The agreement stipulated that the gunmen had to vacate their barricades outside government buildings, but that did not happen. This came after Ukraine’s anti-separatist operations stalled and were a failure. 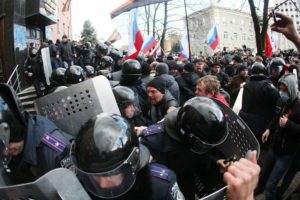 The conflict in Ukraine began after the ouster of pro-Russia Ukrainian President Viktor Yanukovich by months-long demonstrations and a vote by the country’s parliament. Russian forces quickly moved into Crimea, surrounding Ukrainian military bases and forcing them from the peninsula. Now, with tension flaring in the eastern parts of Ukraine (which has a strong pro-Russian population) and Russian troops massing at the border, Ukraine is in a bind.